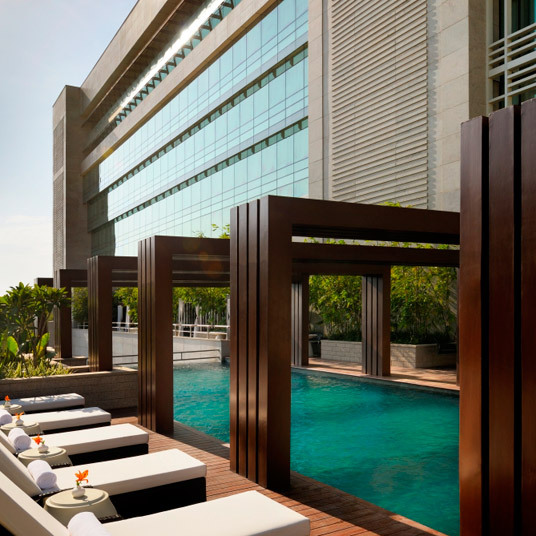 If you’re well-versed in top-flight modern business hotels and you know your Indian cities, the Park Hyatt Hyderabad’s name alone tells you pretty much everything you need to know. 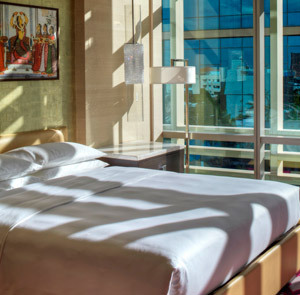 It’s an impeccably polished high-end business hotel to suit its tech-driven, business oriented hometown, every bit the equal of the other Park Hyatts of the world — which, needless to say, is a rather high bar in terms of luxury and service. 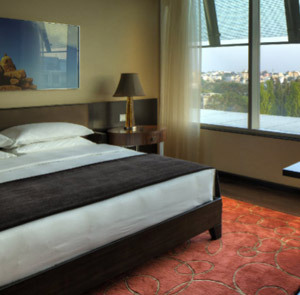 The Hyderabad outpost is set in the upscale Banjara Hills area, ten minutes from the Central Business District and the tech hub — a distance that’s just about right when the work day is done and it’s time to sprawl out a bit, away from the crowds. And there is plenty of space in which to sprawl out. 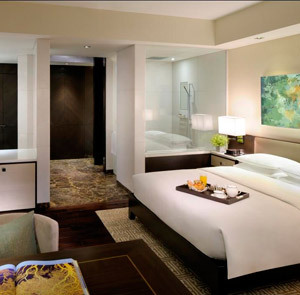 Even the most basic rooms are quite large, with king beds, oversized work desks and big, modern bathrooms. The materials are rich, as well, comprising hand-laid walnut parquet floors, feather bedding, high-end robes; the list goes on. 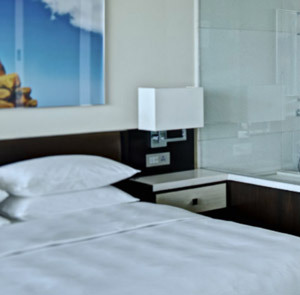 Outside the guest rooms, the services are best described as comprehensive. Everything from a spa and a sauna to salon and shoeshine service is on offer. This is the kind of hotel that still keeps a doctor on call. There’s also an entire team dedicated to meetings and events, plus plenty of banquet halls and meeting rooms, with all the infrastructure of a top business hotel in a tech-oriented city. Last but by no means least is a strong collection of dining and drinking options — an elegant Northern Italian restaurant and wine bar, a Southeast Asian restaurant oriented around an immaculate open kitchen, a dining room where guests can choose from an eclectic menu of classic European cuisine and authentic Indian comfort food, and even a casual lounge for pastries and champagne — pastries and champagne being the sorts of things one takes casually, without need for occasion, at a Park Hyatt.